This method was shared to me by an Indian friend when I told her about my discovery on oil pulling method via a forwarded email that a friend had sent to me. 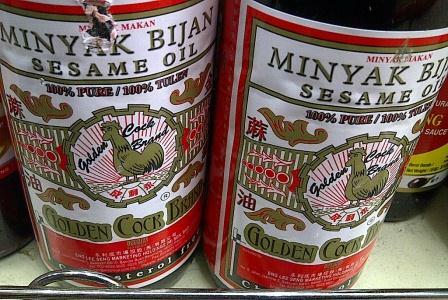 According to my friend, when she was young- her grandparents would make her and her siblings drink about 1 or 2 tablespoon of sesame oil on an empty stomach. Afterwhich, they did not take any food- for lunch- it would be only yogurt rice (cooked in Indian style). By evening, my friend and her siblings would have diarrhea. This is often a strange concept for many people- to drink oil in small quantity to clean out the stomach. It was a detox method that helped in ‘cleaning’ the stomach. That is why it has to be done early in the morning before a person eats anything. And lunch must be very bland food- perhaps if no yogurt rice then just rice porridge. As the oil goes down the digestive track, it would dislodge sludge from the stomach linings due to its oily nature. That explains after about 8 hours, there would be stomach pains as the body attempts to eliminate the sludge from the body. One would find the bowels to be very stinking. My friend said that as a child she used to dread and dislike when made to do that by her grandparents. But now as she had grown up, she appreciated their intention and care. Perhaps you may want to try this method on a weekend if you are not going out. For dinner, you can eat as normal but if possible, do try to stick to something light.